Lord Ganesh is revered as the Lord of Beginnings and Remover of Obstacles. Lord Ganesha is one who is loved by young & old alike. He is worshipped by Shivais, Vaishnavas and even Shakti Aradhakas. Lord Ganesha is seen as Shrewd, Intelligent, Wise and Full of Knowledge. His grace is absolutely essential for our Successful LIfe, be it Financial or Otherwise. 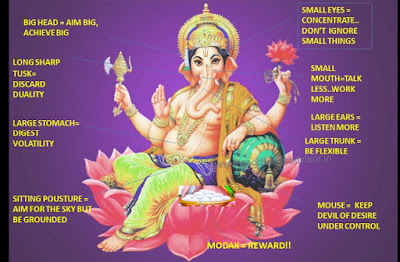 Lord Ganesha's BIG Head indicates us to Aim BIG and achieve BIG. Our Financial Plan should be such that we achieve something BIG in life. Our Financial Plan should take into all the small Nitty Gritty Minute Details which could create obstacles in achieving our Long Term Goals. The Small eyes shows that we need to CONCENTRATE on minute things which look small but not actually be so. Remember : A Small Leak can sink a HUGE SHIP! A saying goes "A Good Listener is a Good Leader". Likewise keep your Ears Wide open to absorb knowledge from all corners and listen to Experts whenever & wherever possible especially when it is from a person like SRIKANTH MATRUBAI!!! The Small Mouth of Lord Ganesh is a indication to us to Talk Less, Talk Sense and Work More. Also dont be loud mouthed with your Finances, discuss your investment plans only with trusted persons like SRIKANTH MATRUBAI!! The Single Pointed Tusk of Lord Ganesh indicates us to discard Duality from our minds. Have a Clear Cut Definite Goal and Focus on 1 Goal at a time and then move on to another. Dont jump from one target to another in between without reason. Your Financial Plan should have the flexilbility and adaptibility to recognise and weed out the Rotting Apples and retain performers. Very important in an ever changing circumstances. Remember a Trunk has the Capacity to uproot a Tree and at the same time, even pick a Needle! Your Plan should be that Flexible!! The Large Stomach shows us that our Plan should have the wherewithal to withstand and digest the Volatility. It should have an ideal mix of Debt, Balanced and Equity Funds. Develop to Digest all the volatility. Have patientce. The BIG Stomach shows Acceptance. While some funds/Stocks could look hugely attractive with all indications of being the next multibagger, stay calm, let the news flow filter out and the dust settle and take required action once the Air is cleared. 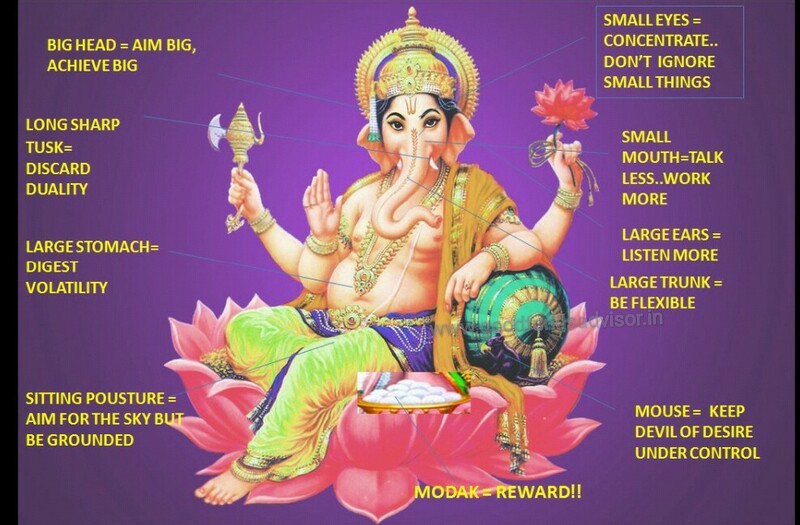 Lord Ganesha's vehicle is the small MOUSE. Mouse cuts Ropes that Bind. Cut desires that make you spend more and prevent from Investing. Keep Desire of Devil under Control. Ride it rather than making it scare you. Even tough the Modak is next to it, the Mouse dare not eat the same without permission of Lord Ganesh. Likewise, no profit booking without your Advisors' consent. Mouse has the ability to see even in Dark. Know how to see the light even in Dark times. Follow your the path shown by your Advisor and stick and you will reach the LIGHT. Control the Mouse (Desires) and you will see LIGHT!! MOUSE also indiciates that even the Mightest depend on the smallest. So, a small SIP could easily make you the CROREPATI. Ganeshaji is usually seen sitting with 1 leg folded and other on the Ground. Meaning aim for the Sky but be rooted to the Ground. Aim for a BILLION even a ZILLION but know your capacity and aim for achievable Goals!! Having a Goal too high could lead to disappointment. Accept your limitations and work towards realistically achievable goals. the Delicious Modak/Kadabu is awaiting for you at the end for your patientce, sharp focus as a Reward. Modak is digestive aid and full of Proteins. And this Prasad is given at the End of the Pooja and you too will get your DESERVING REWARD when you stick to your Financial Plan and follow the advise of your FINANCIAL ADVISOR. Many images of Lord Ganesha has a Snake wrapped on HIS Stomach. This indicated PROTECTION OF CAPITAL (Profit). It also indicates controlling of things which cause us unrest. For a Successful Financial Plan, it is necessary to do constant review, monitoring and need to book profit/protect Capital in case of extraordinary events. May Lord Ganesha bless you with Health, Wealth and Happiness. Very important message by the article to control the emotions of client whenever they see the volatility in market.